Fall is officially here. I love living in a climate where the seasons change, but it's still a little sad when fall arrives. Every spring, when all things become new again I make a personal vow I’ll actually grow something, a garden, a vegetable, a flower. But fall comes quickly it seems, and when it does I have no choice but to face the fact that I've failed again. Miserably. This was post on my old blog. It will give you an idea of what I'm talking about. “So, Joe what did that plant ever do to you? Did it indicate in any way that it had a death wish or were you just being sadistic?” from Rob my second child. Obviously still annoyed he wasn’t born first. How hard could it really be? I mean, it’s spring and the whole neighborhood is brimming with people tending little plants. If they could do it, why couldn't I? Most are growing vegetables, a booming business in this economic downturn. By the way, walking around my neighborhood is a lot more fun than it used to be! I get guys talking to me about their jumbo cucumbers-and they are quite forthcoming with details related to how big they will get with some tender loving care. The lady down the road told me that she traded in her Small Fry tomatoes for Supersonic VF Hybrid grafted ones- explaining that they will keep their firmness when everyone else’s have shriveled and were hanging on the ground. I was able to learn a number of fertilization techniques from the couple next door, but, I digress…. Growing tiny seedlings and transplanting them to the tilled and fertilized outdoor garden went better than expected. I made sure they would have enough sun and made certain they were close to a water source as insufficient quantities of both have derailed my gardens in previous years. I planted them tenderly, with little stakes at the beginning of each row indicating what vegetable my family would be enjoying in a few months and watered my little bambinos. Then I put up a little fence so the area was cordoned off- a necessary visual barrier for the kids as verbal instructions are rarely successful without reinforcement. I stopped in front of my Mother’s house, knowing that what I was about to do was the right thing. I tenderly placed the basket Joe gave me in a blanket, nestled a bottle of plant food between its blossoms and placed the bundle on her stoop. I rang the doorbell, then ran and hid until I was sure mom answered and watched as she brought it in the house. For some time now, Kindle sales have outpaced print books, in both hardcover and paperback. I don't want to get into a philosophical discussion about the values of either, as I believe there is a place for both in any avid reader’s collection. Being tactile myself, I personally will always prefer to feel, smell and flip through the pages of a paper book. I love to look at them on my shelves. That being said, I do like the ability to download and read a book at the touch of a button. My instant gratification switch is turned on and I feel so very green as I do so knowing I have saved a tree. I will walk with my feet on both sides of the line drawn in the sand. Sadly, one of the casualties of the electronic readers is the inability to have an author sign the book. Obtaining a signature and a personal note is one of the pleasures of owning a paper book. In an attempt to fill this void, Kindlegraph creator, Evan Jacobs, has invented a way to send an electronic message and signature to a Kindle upon request. The signature itself is a digital representation of the author’s signature. It gets sent in a separate file to the Kindle or Kindle reader. Another piece of good news; Kindlegraph is free. Of course, I'm a bit of a techno-freak so I think this is great. I jumped on the bandwagon and can now send Kindlegraphs! All you need to do is go to http://www.Kindlegraph.com. Search for my book, "Death Is A Relative Thing" and request it. The caveat is this- At this time you must sign in with a Twitter account. There are alternative sign in options being looked at so I am sure this will change down the road, but currently Twitter is the only option. If you don't have an account and don't want one, I'll be glad to let you when it shifts. For the rest of you who have existing Twitter accounts or are ok with creating one, feel free to send me a Kindlegraph request. The world of publishing is changing by the minute. POD books are being put out by mass market publishers, self-publishers are finally finding respect, electronic signatures and notes are a new way to connect authors and readers, the demise of huge brick and mortar stores, they are all shifts that are rocking our world. I don't know if anyone can tell where it's all going or how our reading habits will change. I do feel however, that as long as we are still reading and we can still be touched, thrilled, terrified or tickled silly by words, we are doing ok.
As was commented by Evan Jacobs my Kindlegraph page is http://kindlegraph.com/authors/HPatrone . You can head right there and not have to search. Additionally I have added my short story "The Harper's Ring" to the Kindlegraph page. Thanks! Hi there! 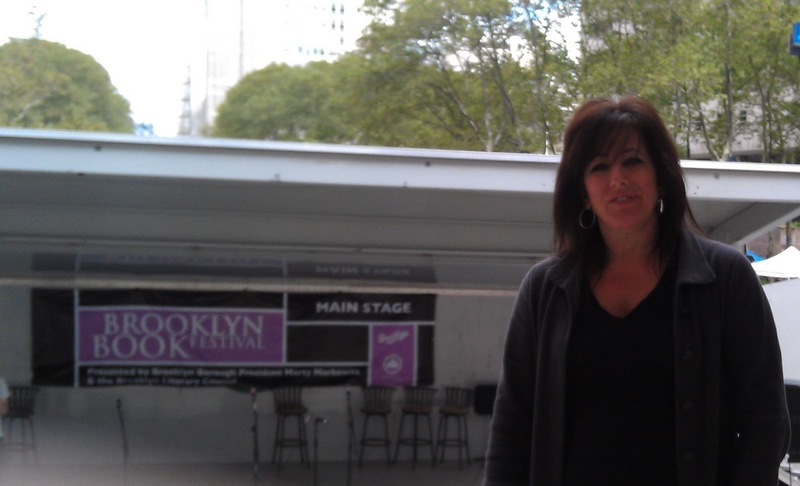 Today my mother and I went to the Brooklyn Book Festival. We had a great time. The weather was a little cool, mostly overcast but the sun kept peeking through and warming us up. 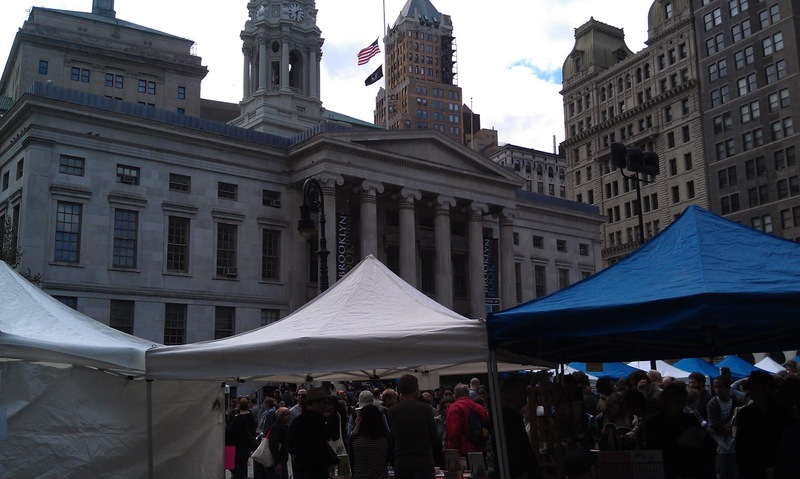 The place was jumping-there were a lot of people to negotiate as we went booth to booth. Some were handing out bookmarks, and of course I reciprocated with my own! Street fairs of any kind are fun and this was no exception. I networked. 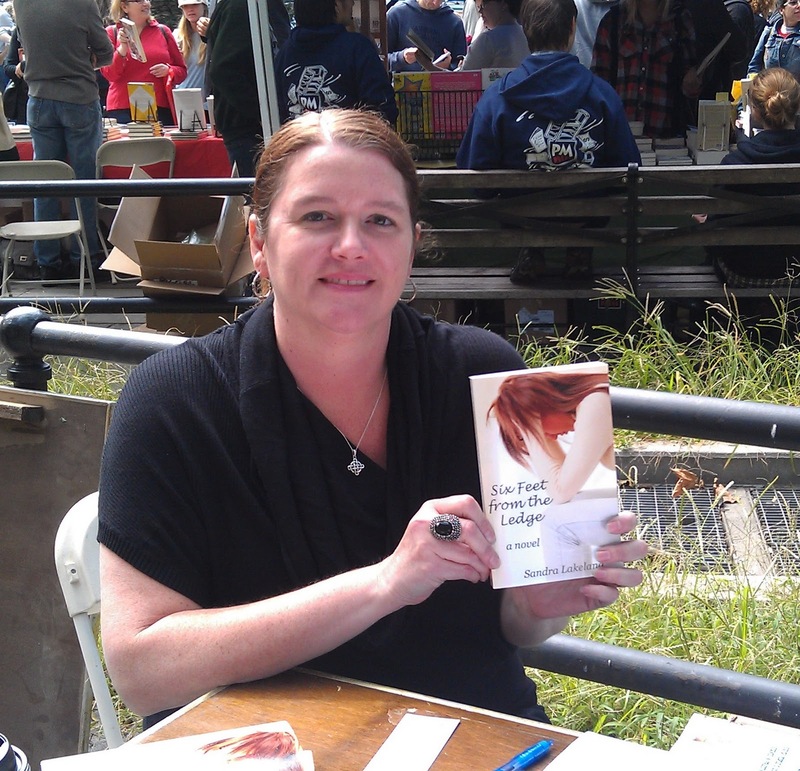 I talked to some publishers, some workshop coordinators and some authors. 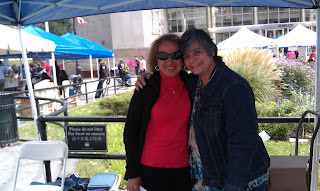 I met one author who self published her book Her name is Sandra Lakeland and her book is 'Six Feet From The Ledge'. (http://amzn.to/qpbdg3) She was here from Texas. Of course, I haven't had time to read the book, but I'm sure I will. It sounds great. I thought it was wonderful she came from the midwest to Brooklyn. ﻿Then I stopped by the Pro Press tent ( http://www.propressbooks.net/index.html )- and met up with my author/Indie Publisher friend Grace Protano (Absent From Class, As Long As You Can See The Clock, You're Okay). There I had the opportunity to meet her friend turned author Mary Mineo Marra who has a book coming out soon called "Getting Fit With Adam". We had a few laughs and planned an adventure or two. Actually Grace planned...she's just dragging me along kicking and screaming! The greatest thing about the festival was the energy. You can feel the passion everyone has about their work whether it be a book, a publishing company or a group that holds workshops for disadvantaged persons who long to write. 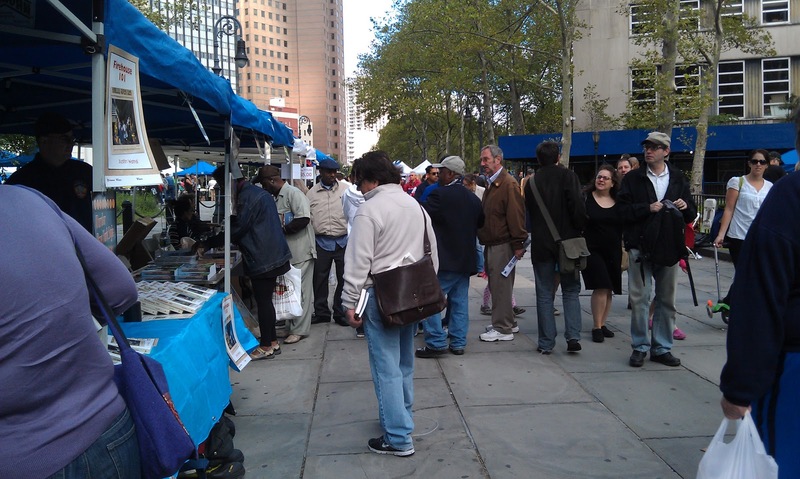 I look forward to next year when hopefully I am there as a vendor/author. I’ve been so focused on promoting 'Death Is A Relative Thing', that at times I think nothing else has happened since the book came out in June. Fortunately I have a complete record of what I have been up to in the form of Facebook posts. I have not been as single minded as I thought! 2) School tomorrow! This is my baby- number five and headed to Middle school...I could wax poetic and ponder on where the time has gone OR I can do the pee pee dance DUUUUUUH! Take a guess! 3) My daughter is making French toast for herself and what does she do? Yep folks, she set off the smoke alarm. I'm so damned proud! 4) We made it to Kingston NH -Marisa mentions that my mother said she got a ticket in this town. I said "Boy Nona gets a lot of tickets doesn't she?" And Marisa says.....wait for it...."Yeah for an old lady she does." 7) Cupsogue beach. Put purse in back seat. Locked it. Can't find keys. Called hubby who says to call a friend who could help. Guy too far away but tells me-find a Bay Cop. Found one-but no lock out kit. Cop was nice. Emptied trunk looking for slim jim. No go. Takes a ride and comes back with kit. Opens door, we rejoice. DUH keys not in purse. Found them in a bucket that we had all the while. I DO need to write a book. Here we go. It's a giveaway of my e-book "The Harper's Ring." Yeah! I love FREE things! 1) It is running FOUR DAYS ONLY only. Midnight Friday Sept 9th through midnight Monday September 12th, 2011. 2) Buy a copy of Death Is A Relative Thing sometime during those four days from Amazon.com in the Kindle or paperback version. 3) Copy and paste the "description" portion of your receipt that shows the order number and the book title (there is no credit card information on this) and send it to info@hpatrone.com. I will then gift my e-book "The Harper's Ring" FREE to any email address you specify. So there it is! Easy and cheap....sounds like, well, I won't say it! Have fun. Thanks so much and don't forget to email me.